How To: Kayak Fishing, Practice Makes Perfect. Can't afford a boat? Don't worry you can still get out to the fish no problem. 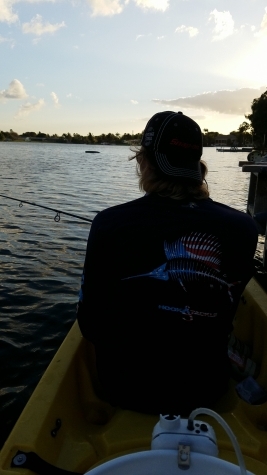 Fishing from a kayak requires preparation and attention to detail. Details such as, do I have an anchoring method, or how can I secure the kayak when traveling. From personal experience, we can tell you that the first few times you go out on the lake of your choosing you may not catch many fish. You may spend all day figuring out how not to fish on a kayak before you end up catching a fish. We have done this, we once spent 7 hours watching peacocks chase other fish out of there spawning beds but not one hit a lure. Luckily this was not one of those days. In this picture we ended up pulling in about 20 peacock bass in just over an hour, and took the last hour to relax and take in the sunset. We were able to get to the fish because we currently fish out of a 13.5 foot sit on top kayak. We suggest testing a few kayaks before you purchase one, sometimes you love the design idea but when you get in the thing and fish for 5 hours you find out that it is not the right fit for you. We had to make some minor adjustments to ours but nothing too serious. Also rod holders are key, figure out how you want to place them and install them afterwards. Don't get too caught up in choosing a kayak for the rod holders and their position, they can be easily added later on. 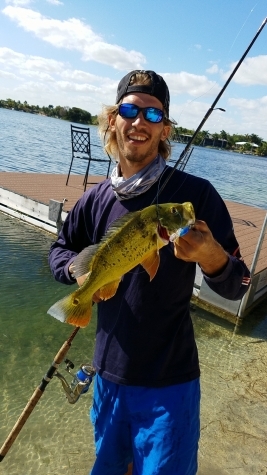 All in all kayak fishing is a moderately less expensive and convenient way to get out on the water for a quick trip after work or a last minute try for a lake record. We hope you enjoyed this article, check out our recent article below!